Anyone who knows Rachael Treasure's writing knows that she writes a ripper short story - full of warmth and heart and humour and with characters as lively and lovable as Rachael herself. Although many try to, no one can replicate that special, original 'Treasure take' on the world that comes through in all her rural stories, long and short. You will laugh and smile your way through this collection, which includes the favourite stories 'The Girl and the Ghost-Grey Mare' and 'The Evolution of Sadie Smith', as well as some earlier works - and most importantly, a number of entirely new stories. All the stories have rural settings but they aren't all romances. There will be 'something for everyone' in this book. A must-have addition to any library for all those Rachael Treasure fans out there, as well as a perfect Christmas gift for young and old. 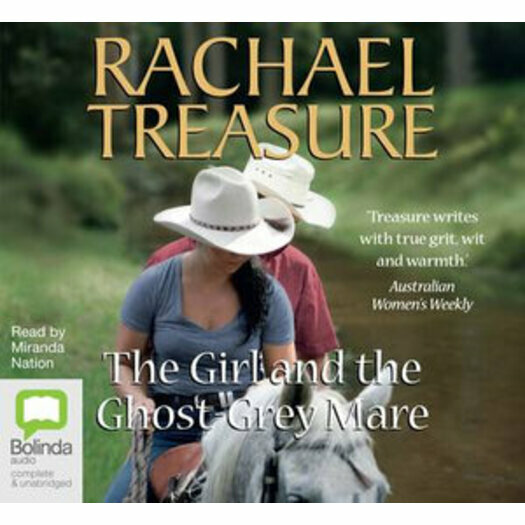 Sell yours Books » Fiction & Literature » General The Girl and the Ghost-Grey Mare By Rachael Treasure RRP $29.99 $20.51 Save $9.48 (32%) Free shipping Australia wide Fast shipping available from our warehouse Ships within 24 hours from local supplier Order now for Christmas delivery Rating: 1 2 3 4 5 Register or sign-in to rate and get recommendations. Format:Paperback, 256 pages Release Date: 03 October 2011 The Girl and the Ghost-Grey Mare by Rachael Treasure Anyone who knows Rachael Treasure's writing knows that she writes a ripper short story - full of warmth and heart and humour and with characters as lively and lovable as Rachael herself. Although many try to, no one can replicate that special, original 'Treasure take' on the world that comes through in all her rural stories, long and short. You will laugh and smile your way through this collection, which includes the favourite stories 'The Girl and the Ghost-Grey Mare' and 'The Evolution of Sadie Smith', as well as some earlier works - and most importantly, a number of entirely new stories. All the stories have rural settings but they aren't all romances. There will be 'something for everyone' in this book. A must-have addition to any library for all those Rachael Treasure fans out there, as well as a perfect Christmas gift for young and old. Rachael Treasure's first novel, Jillaroo, published in 2002, has grown to become one of Australia's iconic works of fiction.